In the Amish town of Sugarcreek, love comes in many forms. But will it come at all for Miriam? Miriam Zehr has worked at the Sugarcreek Inn longer than she cares to admit. The restaurant is a favorite of town residents as well as the many tourists who come to taste the famous Amish fare. Though she always tries to have a smile for every customer, deep down Miriam knows something's missing: a family of her own. Miriam has never felt particularly beautiful, especially because she's always been a bit heavier than other girls her age. When Junior, the man she's pined for all her life, suddenly seeks her out, she's thrilled to be noticed . . . until she realizes he's only asking her to help get the attention of Mary Kathryn Hershberger, her pretty friend. If Miriam helps Junior court Mary Kathryn, she'll get to spend a lot of time with him, but she might lose him in the process. Are these few stolen moments worth a lifetime of sacrifice? Is Miriam right to even hope for the life she dreams of? A beautiful story of faith, hope, and second chances. Her characters are so real that they feel like old friends. Once you open the book, you won’t put it down until you’ve reached the last page. Once I began reading it, I couldn’t set it aside until I had read every page...a delightful story. A story of love, grace, and yes—hope. I loved Miriam Zehr from page one. 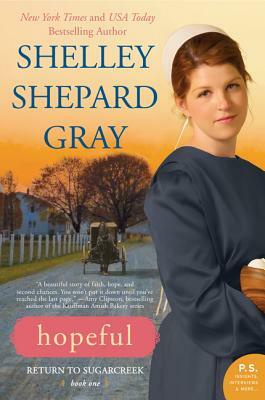 Shelley Shepard Gray has once again written a story that will captivate readers. With her endearing and delightful characters, written in her trademark descriptive style, author Shelley Shepard Gray has once again crafted a story that will capture readers’ hearts from the first page.